Soulié’s one of a kind hand appliquéd ribbon yoga mat bag in a collection of white and metallic ribbons that exudes elegance and glistens in the sunlight. Internal and end pockets ensure that you always have space for your extra items + an adjustable strap means the bag will fit comfortably on any yogi. The color of their Pure Inspiration bag mirrors the strength each of us has to not allow our dreams to be muddied by disbelievers. The simple mix of metallic, white and pastels keeps you true to your dreams. Life is your canvas — Fill it with the moments that keep you inspired. 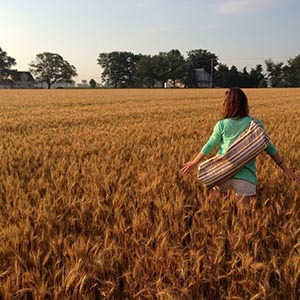 You can see this yoga mat bag and other products from Soulié on their website. Enter every day November 30th – December 4th to increase your chances to win! Soulié creates breathtakingly beautiful, artisan made accessories for your yoga practice, lifestyle and home. All of their pieces are ethically sourced & provide beautifully dignified work for their artisan partners. Soulié’s artisan made accessories incorporate craft traditions in a new and modern way, preserving both craft and culture while empowering you to trust in your own unique beauty. Every item sold supports Soulié’s Artisan Scholarship Fund, providing skills training for artisans all over the world. Visit the Soulié website.